Highlights from this month include details on the Phoenix Film Festival, Phoenix Lights Festival, Cactus League Spring Training, the LPGA Bank of Hope Founders Cup, a variety of upcoming food and drink festivals, and more. Highlights from this month include details on upcoming food and drink festivals such as the Flying Burrito Food and Music Festival; art events and exhibits such as the Scottsdale Arts Festival, and details on more events such as the LPGA Tour's Bank of Hope Founders Cup, the just-announced Arizona Tennis Classic, the Arizona Black Rodeo and lots more. Highlights from this month include details on upcoming food and drink festivals such as Strong Beer Festival and Rockin' Taco Rumble; art events and exhibits such as First Fridays Art Walk, and the Carefree Fine Art and Wine Festival; and details on more events such as the Arizona Renaissance Festival,, Scottsdale Arabian Horse Show, Phoenix Pride Parade and Festival and more. Highlights from this month's edition include: unforgettable holiday events like the Fantasy of Lights Boat Parade, Phoestivus Open Air Holiday Market, and the stunning light display Glendale Glitters. Enjoy decadent winter spa specials like a warm apple cider pedicure at Arizona Grand, or taste a Christmas-themed cocktail at the Valley's first holiday pop-up bar at Blue Hound. Highlights from this month's edition include new sunset flights with Hot Air Expeditions, an intimate craft cocktail bar Across The Pond, exciting outdoor fall events like Tempe Festival of the Arts, bottles 'n brews at NovemBEER, and timeless holiday activities such as CitySkate and The Polar Express which the entire family can enjoy. Highlights from this month's edition include: brats + brews at Oktoberfest in downtown Phoenix, tacos + tequila at the renowned Arizona Taco Festival, a Howl-o-ween Dog Parade, cheesy goodness at Phoenix Pizza Festival, and quite a few more exciting fall festivals across the valley. Highlights from this month's edition include: a new international flight from Sky Harbor; all-new AC Hotel by Marriott Phoenix Biltmore; our roundup of fall festivals; new restaurant concept Fellow; and much more. Highlights of this month's edition include: CLEAR biometric identity platform at PHX Terminal 4; new Italian-eatery concept Fellow; end-of-summer resort deals; and the highly anticipated shipping container marketplace, The Churchill. 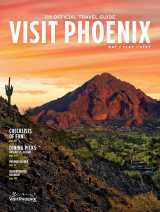 Highlights of this month's edition include: the purchase of the Sheraton Grand Phoenix; free admission for children at the Phoenix Art Museum; the newly announced tenants of shipping container marketplace The Churchill; A Mirror Maze: Numbers in Nature at the Arizona Science Center; summer spa deals; a new Arcadia location for Angels Trumpet House and more. Highlights of this month's edition include: flights from Phoenix to Frankfurt at Phoenix Sky Harbor International Airport; summer packages at a variety of resorts and hotels; educational camp at Taliesin West; and the upcoming opening of Chula Seafood Fresh Fish Market + Restaurant. Highlights from this month's edition include: the opening of USCareWays at Phoenix Sky Harbor International Airport; the newly opened Hampton Inn and Suites Phoenix Downtown; unbeatable summer deals across multiple Valley resorts; and the Musical Instrument Museum's Summer 2018 Concert Series. Highlights from this month's edition include: The Arizona Diamondback's 20th anniversary celebration; Candlelight Yoga Series at The Spa at Four Seasons Resort Scottsdale at Troon North; International Jazz Day at the Pueblo Grande Museum; and summer getaway deals at The Camby.